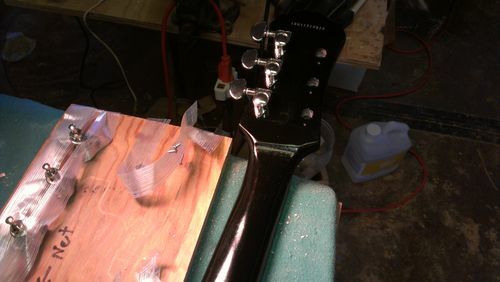 As promised, although a little late, here is the second and hopefully final part of my Les Paul headstock/neck repair. I would have done this yesterday but an unfortunate occurrence happened…... My boss wanted me to work. Anyway, I got a coat of clear lacquer on over the top of the black lacquer and it went on much more smoothly. After letting the clear coat dry overnight it still had a faint orange peel to it so I got out some 1200 grit 3M wet-dry sand paper and skimmed it off a little bit. I ran out of 2000 grit paper and it was too late to go anywhere and get any so I grabbed a medium heavy paper grocery bag and used it. This worked moderately well, but still left a rather satiny finish. Next I got another piece of the paper bag and wet it down with isopropyl alcohol then set to rubbing the lacquer down again. This time it came out much nicer and smoother and shinier. Next up was a coat of Johnson’s Paste Wax. Now it’s nice and slick! Now we have to get the strings on it. I chose to use the strings I had removed from it as they were nearly new and I didn’t want to waste another set if it broke. 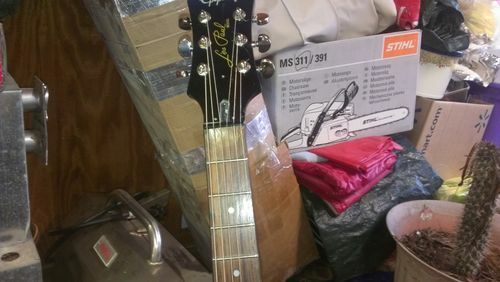 The strings I have been using lately are Fender 150JL’s .012-.050” these give both the Strat and the Les Paul a smoother more mellow tone in my opinion. All that was left to do was tune it and test it. This little app actually shows you what frequency you are tuning at and you can choose from a number of tuning styles. Forgive me for the really crappy playing. I couldn’t find a pick and my blood pressure had fallen to a really low level because of some of the meds I take. Deft Gloss Clear Lacquer as a final coat. All in all I would say this looks much better than my original repair and I am much more pleased with it. It is a skill building process, especially in finishing and sanding and fitting. All of these skills I need to practice more. If I can get a shiny shiny shiny finish on a guitar neck, nearly as good as the original, then I’m sure anyone can! 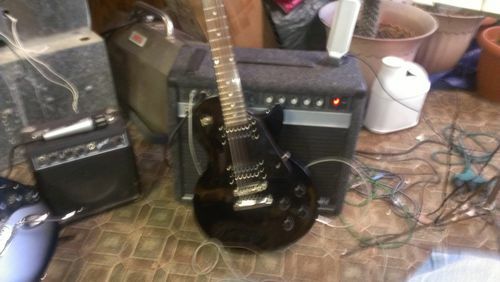 This guitar should sell for around $200 – $250 especially if I include a small practice amp. Great repair job Dallas, I really enjoyed the blog, oh, and the little demo at the end. Very nice fix for sure. Today I got a new one in the mail. 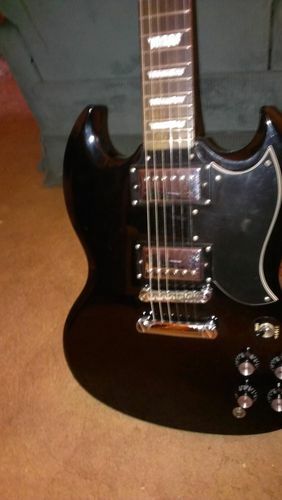 It’s a 2007 Epiphone SG Elite model. It has all the bells and whistles. 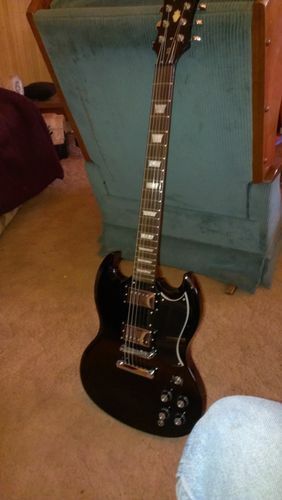 Someone removed the original batwing pickguard and replaced it with a one sided model. The screw holes were filled and painted and don’t look too bad. I may try to fix them or leave them. I don’t think it matters too much. It came with really nice Darrdario strings and the electricals are 250k caps on original pots. The pickups are Humbucker V on the Neck and Humbucker V-Pro on the bridge. 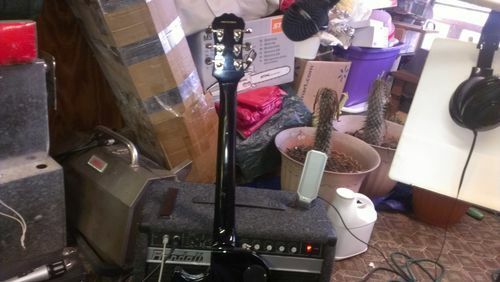 It feels really nice in my hands, has a great sound, even with my tiny little amp, no buzz except on the low E, and that is an easy fix. I wish I could keep it, but I will have to do a bit of decent setup on it and sell it. We will be kicked out of our jobs soon and I need to bring in as money as I can to buy a place or at least lease to own.